What seemed to prove Stan wrong were all those evenings with Gary Lineker as a nation watched football re-establish its popular appeal and never mind FIFA or those missed penalties in the semi-final defeat to West Germany either. 28 years later and an England team at last winning a World Cup penalty shoot out, reaching a World Cup semi for the first time since 1990, Harry Kane lifting the tournament Golden Boot award for top scorer, surely its scraping the limits of Left miserabilism to suggest Stan’s prediction is about to come horribly true? Afraid not, Russia 2018 might just prove to be as good as it gets. As guardian of a global game one of the good things FIFA has done, yes really they do exist, is expand the frontiers of football. Of course they’re after markets rather than nurturing the worldwide culture of the sport but taking the World Cup to the USA in ’94, Japan and South Korea in 2002 and South Africa in 2010 were absolutely the right thing to do. And in the same regard Russia 2018 too, the first post-communist country to host the tournament. However each of these host nations had some kind of proven domestic football infrastructure and in addition they had all previously qualified for World Cups, not as hosts but in their own right. The Middle East was the next most obvious part of the planet to take the World Cup to, but not Qatar. Apart from the scandal of the lethally unsafe labour practices that underpin the building of the new stadia, the deaths of these construction workers reportedly number in the hundreds, this is a country that has never before qualified, or come very close. There’s no depth or breadth to football in the country. Football is a tool of Qatari soft-power diplomacy and that’s about it. A Middle Eastern host, an Islamic host, yes but the most obvious candidate that ticks all the right boxes is so obviously Iran that it could not have ever have even been considered speaks volumes. Instead Qatar won the bid and then it was swiftly decided that because of the intense heat in the country during June-July the tournament would be switched to the autumn. Resistance to this can be a tad Eurocentric, after all the southern hemisphere nations play much of their football in their winter, our summer. But the reality is for the northern hemisphere what makes the World Cup so special is that is at the end of the season. A once every four years, with a Euro thrown in too in between, summer of footballing love. This is what more than almost anything else draws in the crowds way beyond the footballing diehards. November 2022 will disrupt all this, an early winter break from the promotion tussle and Champions League that will struggle for attention out of their huge shadow, a kind of after-show to what is so rooted in our sporting calendar, the season. What has defied Stan Hey’s pessimism more than anything else is the way that popular consumption of a World Cup overwhelms its marketing and commercialisation. At home that’s the TV audience, not in the house but turning watching the games into a mass public spectacle. Whilst away from home the travelling fans magnify this even more. The latters requires a huge existing set-up of cheap hotels, airbnbs, campsites and the like. England’s support in Russia was relatively small – the interest will be much bigger next time - but the South Americans, Japanese, Mexicans however travelled in their tens of thousands. It’s them who turn the World Cup into a carnival outwith the control of either FIFA or the host nation authorities. It will be wonderful if such a thing happens in Qatar but if these facilities are lacking it won’t worsening still further the absence of our summertime festival back home. Qatar threatens giving the World Cup’s gloriously revived popularity a knockback and things could get even worse at the 2026 tournament. What makes a tournament so special is the way the host nation defines it, often in the process defying the worst possible stereotypes. No, Russia hasn’t overnight become a worker’s paradise but neither is it the hell on earth that much of the media build-up presented it as. It was the Russian people, not Putin, who turned their country for the past four weeks at least into a place to savour not to fear. Not content with UEFA choosing to ignore the importance of a single host nation by spreading Euro 2020 over the entire continent FIFA has awarded World Cup 2026 to the joint bid of USA, Canada and Mexico undermining this crucial national identity of the tournament. A process both justified and amplified by the expansion of the competition to 48 nations. This will result in either dragging out the tournament longer than the current four weeks, meaningless group games when the group winners are already settled, tired legs and poor quality football thanks to shortened recovery time. Quite possibly World Cup 2026 will suffer from all three, which coupled with tis lack of a single defining host doesn’t bode well. Of course hope must spring eternal but it’s not looking good and once the World Cup loses its huge and hard-won popularity then it may never recover. These forces which create such a wondrous sporting event on a global scale are both within and without the control of FIFA. But if it sacrifices that which it cannot govern, this global popular reach of football, to suit those within its control, FIFA’s organisational ends and commercial interests, then it will only have itself to blame. The World Cup is the one truly global team sport event. It is the emotional investment in their team of an entire nation, multiplied 32 times across the planet which defines it. Thus, Russia 2018 revealed another seed to its eventual downfall. No South American team in the semis, when that happened in 2006 it was the first now with no South American winner since 2002 it is in danger of becoming a habit. No African team made it beyond the Group stages, just the one Asian team, Japan and they went out, if more than a little unluckily, straight away too. The globalisation of European football, with club teams stuffed full of imported South American and African talent doesn’t appear to be benefitting the teams of the countries where they’ve come from. Football’s version of colonialism, fuelled by neoliberal globalisation, that’s what it is beginning to look like with nobody in their right minds imagining FIFA will be much minded to do very much about it, their guardianship of the global game never being more important than the drive for profit. Sounds familiar? Still at least for four glorious weeks it did at least look like, as the song goes, ‘football’s coming home’. Call me po-faced if you want but I have a problem with this particular notion. Don’t get me wrong I like a mindless football chant, especially one with a half-decent rhythm as much as the next fan. But England, home of football, coming to, what does that imply exactly? In World Cup terms we are anything but. England boycotted not only the first World Cup, but the next two as well. We finally decided to join in at Brazil 1950, promptly losing 1-0 to the USA in the Group Stage. And when we hosted the ’66 tournament the then FIFA President, Englishman Stanley Rous, thought it was acceptable that the entire continent of Africa merited one place. Unsurprisingly they told where he could stick that and refused to take part. If we insist on nominating football’s home there’s only serious candidate, France, the country who invented this most wonderful of tournaments, the clue after all is in the name of the trophy, Jules Rimet. But the point is that this tournament works because football’s home is everywhere, it belongs to every corner of the earth, the one truly global occasion in our lives. It is the people, the fans and the players who make World Cups not one country nor FIFA’s either. And right now just like Pelé in 1958 and the following three tournament in Mbappé, un garçon des banlieues, France and the world has a player who epitomises that for the next few World Cups to come. Merci beaucoup,but handle with care. Mark Perryman is co-founder of Philosophy Football, AKA ‘the sporting outfitters of intellectual distinction’. 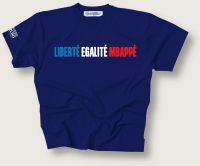 Our Liberté Egalité Mbappé shirt is available from here.